"Like" token, awarded by Nemo_bis. "Like" token, awarded by santhosh. Until Content Translation is able to provide suggestions, we can redirect users to an existing tool that helps finding articles to translate. The transition won't be as fluent as desired, but it may be useful still. This can be integrated into the dashboard or the "new translation" dialog using a link like "Looking for ideas on what to translate?". 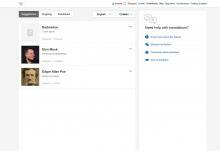 Pginer-WMF added projects: ContentTranslation, Design. Pginer-WMF changed Security from none to None. @Nirzar included a side area for help in his mockups of the dashboard. While we don't have suggestions, including the link there would make sense. We may want to do do some of the work as part of this card or at least make sure that it will be easier to move there once that is supported. Show the link below the "create new translation" button, to facilitate vertical scanning. Use the style for links used in the page (notice they don't have underline). The current text ("looking for articles to translate?") looks good, but I'm afraid that users may though that they can start a translation form the external tool and get lost. So I'm more inclined to be more explicit ("Find articles missing in your languages"). Make sure it opens in a new window (I have not tested the patchset, just looked at the screenshot so I don't if that is currently the case). 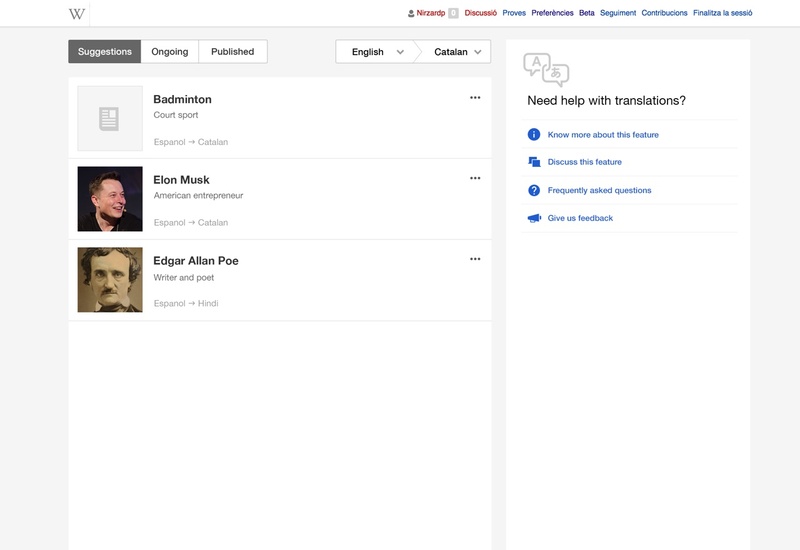 Land the user in the tool with the target language set to the current wiki language and the source one to a different language we guess may be relevant to the user (based on current translations if any, or our usual guesses). Make sure is different from the target language. Amire80 mentioned this in rECTX60d20bc25ab4: Add a link to Magnus's "Not in the other language" tool.